If you live in the UK or find that most of your site’s visitors are located in either the UK or Europe region, you may want to look for a company that provides servers that are physically located in the UK. Getting hosting from the UK means that you or your visitors will see less lag when visiting your site and that you may be able to physically drive down to the data center and work on your server if something should go wrong. In this article, we will look at the advantages of hosting in the UK as well as some hosting providers that provide UK based hosting. What is UK Web Hosting? First of all, as with all non USA based hosting, you need to make sure what kind of the UK hosting they are talking about. 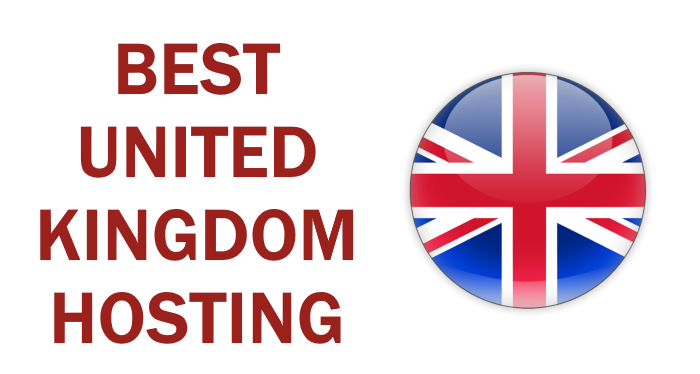 Many companies who claim “UK Hosting” are simply based out of the UK but their servers are actually located in the USA. Hosting with one of these hosts is no different than hosting with any USA host, except that you are paying in the more expensive UK currency. When looking for a potential UK host, always ask where their servers are physically located before anything else. You can also ping their server to see if their IP address matches up with a UK IP range. For a company that actually has physical servers located in the UK, there will be two main advantages. First is the lag or ping time to your servers. We are not talking about minutes of loading time difference. We are talking about fractions of a second in bandwidth speeds. This may sound insignificant as an advantage, but on certain sites that host interactive chat and real-time online games, this can be critical. If you do run a 3d chat server or a gaming server and are primarily focused on the UK audience, then you must get a server that is located within the UK. If you do not host one of these types of sites then this is less of a concern. 2. The second advantage of actually hosting in the UK is you are in close proximity to your server if you actually live in the UK. Since the UK has many datacenters, you have your choice of which major city your server is located in. If something should go wrong and technical support is not being that responsive, then you can just simply drive down to the datacenter and work on the server yourself. While this does not seem appealing to most people, for some people who are server gurus, this is a large advantage and worth considering if you are good at troubleshooting servers. While these two advantages are certainly nice to have the one big disadvantage that UK hosting has compared to US hosting is cost. Because of the exchange rate(and the fact that stuff just costs more in the UK), you will be forking over some big bucks if you want quality UK hosting that costs significantly more than US hosting of the similar quality. However, if you don’t find paying a few extra dollars a month and want the benefits listed above, then UK hosting is a solid choice. Fasthosts is a long-time leader in UK hosting with hosting offerings ranging anywhere from a basic shared hosting account to dedicated servers. Their server, company, and offices are all located in the UK so your bandwidth and technical support are all UK-based. Plans start at 3.99(GBP) per month and include 1.5GB space and “unlimited” traffic. These guys offer both linux-based and windows-based hosting as well as mySQL databases so you have a wide selection to choose from in regards to what the develop your site in. For newbies, they have a friendly site-builder to assist you in starting a site. However, many comments by former customers have been negative with this host stating that security and customer support are major issues and you should look elsewhere for hosting. Their “unlimited” bandwidth offering bothers me as hosts that offer “unlimited” bandwidth on shared accounts always tend to have problems in key areas such as server stability. Euk provides economical UK hosting packages and provides shared hosting, VPS(Virtual Private Hosting), and dedicated servers that are based in the United Kingdom. Regular hosting plans start at just 22.99(GBP) per year and come with 200mb space and 2GB bandwidth. The highest tier shared plan starts at 69.99(GBP) per year and comes with 10GB space and 100GB bandwidth. All hosting comes with PHP/MYSQL databases, Cpanel/Fantastico, and many server-side scripts. Shared SSL is also available at an extra 39.99(GBP) per year. Standard 24*7 on-site live-chat support is available to all customers as is 24*7 toll-free live phone support. Recent customer reviews have found this host stable and reliable and a decent bet to place your site with. United hosting offers hosting from either USA or UK servers and provides shared, reseller, and dedicated hosting packages. Shared hosting plans start at 5(GBP) per month and include 200mb space and 5GB bandwidth and go all the way up to 2GB space and 20GB premium bandwidth for 14(GBP) per month. If you are not quite sure of your needs or which package is best for you, you can talk to pre-sales staff and they will suggest a package to best fit your needs. All packages come with a control panel, MySQL databases, and SSL server space. Also included are Awstats and one-click downloadable backups. This host does not oversell and guarantees 99.9% uptime and dedicated 24/7 support. Most customers have had very positive experiences with this host but a select few have had complaints about them after their last server move. Web hosting UK offers web hosting on both Linux and windows platforms ranging anywhere from shared hosting to dedicated servers. Whether you want a personal site, need a reseller account, a Virtual private server, or a full dedicated box, this company has a hosting plan for you. Hosting starts at just 19.99(GBP) per year and comes with 200mb space and 3GB bandwidth. If you happen to need more, plans for shared hosting go all the way up to 10GB space and 100GB bandwidth for 69.99(GBP) per year. All plans come with Cpanel/Fantastico and well as PERL, PHP, and MYSQL databases. Also included are Zend Optimizer and Ruby on Rails. Support can come through on-site chat, phone support, or ticket support. 5. ukhost4u (www.ukhost4u.com) – Based out of a London datacenter, this company offers basic, reseller and Virtual Private servers. Basic Hosting starts at 39.99(GBP)per year and includes 2GB space and 100GB bandwidth. Cpanel/Fantastico comes standard with all hosting plans and does PHP5 and mySQL support. Support can be reached via help desk ticket or e-mail and general webhosting questions can be answered in the members-only forum. However, recent member reviews about this host have casted shadows on them as their setup time is slow, the quality of support is not up to par, and sales keep on getting lost or misplaced. For now, I would look elsewhere for UK hosting.